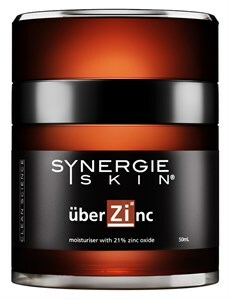 We are fully stocked in the complete range of Synergie products. 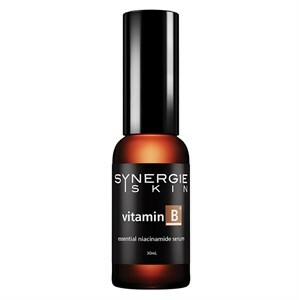 Skin brightening serum for a radiant & even skin tone. This cutting-edge skin brightening serum is designed to improve the appearance of uneven skin tone, to enhance skin clarity and luminosity. Shake well before use. Apply sparingly to affected areas in the morning and evening. Apply twice daily 2 weeks prior to facial IPL, laser or any clinical treatments. Ensure broad spectrum sun protection (Überzinc or Synergie Minerals foundation) is applied after the serum to help prevent from sun damage and further darkening of hyperpigmentation. is a powerful botanical anti-inflammatory. This highly absorptive ingredient significantly improves uneven skin tone and discolouration whilst reducing redness and inhibiting excess release of excess oil from the sebaceous gland. An innovative new peptide that works on multiple pathways. The result is a significant reduction of pigmented lesions and overall skin brightening. Boosts skin immunity and increases the production of the skin’s natural ceramides in the stratum corneum to fortify barrier and promote hydration. Assists in regulating oil flow, minimising inflammation, increasing collagen and reducing the appearance of hyperpigmentation.